Ace stopping off point in the wealthy Edinburgh suburb, we treated ourselves to a cornucopia of great beers including Sampo from Thornbridge, White Out from Cromarty and Island Hopping from the Swannay Brewery. Good Bombay mix too although the atmosphere was weird at times – an extra from the Carry On movies seemed to have wandered in and the boisterousness from a bunch of students might have attracted the attention of Paul Calf had he wandered in. Called in lateish on Wednesday evening and amongst a choice of seven ales there were two from the Valve brewery in Edinburgh, a brewery I had not previously heard of. It turns out that it was the brewery launch night so I had to give them a try. First I had Garden Hop 3.8% which was an unfined darkish bitter with a slight malty taste which was perfectly drinkable without being outstanding and then followed by Matchbox, 4.1%, a blonde hoppy ale which was very good indeed. I will certainly give this another try when I next get the chance. There was also a keg offering from this brewery which I didn't try but seemed to be popular with others. You will never be lonely in the Stockbridge as it is always popular with all ages and with a wide choice of beers, both cask and keg, and plenty of malt whiskies as well. Of the seven real ales Highland Brewery Island Hopping and Alechemy Brewery Ritual are regulars with the others constantly changing, mostly but not all from Scottish micro breweries. 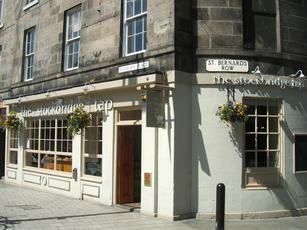 No wonder the Stockbridge is the current Edinburgh CAMRA pub of the year. Two ales on at lunchtime NYE (guess saving others for evening), both good - food (particularly burgers) looked good but did not try - staff looked busy but like they enjoying working together and serving punters - would come back. Visited this pub for the first time last week after discovering that it was hosting an Autumn Real Ale Festival. Beers sampled were Highland Orkney Blast, a pale golden ale which was very tasty, Saltaire Cheeky Kriek which failed to have the cherry kick I was expecting and Tempest Brave New World on keg - a delicious 7% IPA (only being sold in half-pint measures). On a return visit I had Boggart Hole Clough Rum Porter and Steel City Sheffield Hop Infusion Team - both were excellent. The pub itself is L-shaped, wooden floored, with green tiles and several engraved mirrors advertising defunct breweries. There are fireplaces at both ends, though the one at the front is obscured by an ugly wood-burning stove. I wasn't keen on the church pew benches which were a bit hard on the rear though there are some armchairs and sofas further back. Along with the new BrewDog Bar, this was the best beer I drank all week and the pub is on the itinerary now! Stumbled across this pub whilst walking the Water of Leith. Very pleasant atmosphere and 6 handpumps featuring mainly Scottish micro beers. Excellent Pentland IPA on our first visit; we came back later in the week as it was a beer festival - Loch Fyne Jarl being the standout beer for us. Staff were pleasant and on top of the game whilst we were there, including serving up some appetising meals.